It's around this time of the year, whilst the film award seasons is in full swing, we celebrate the craft of acting and film-making. The role of an actor is often to make every character believable, despite the content's origin and fictional structure. Adetomiwa Edun has proven to be one of the most promising and gifted actor, with his innovative performs on stages (most noticeable as Romeo at the Shakespeare's Globe) and captivating charismatic personality on the screen. I spoke with him about the joys and challenges of his craft, and the meeting points of life and creativity. 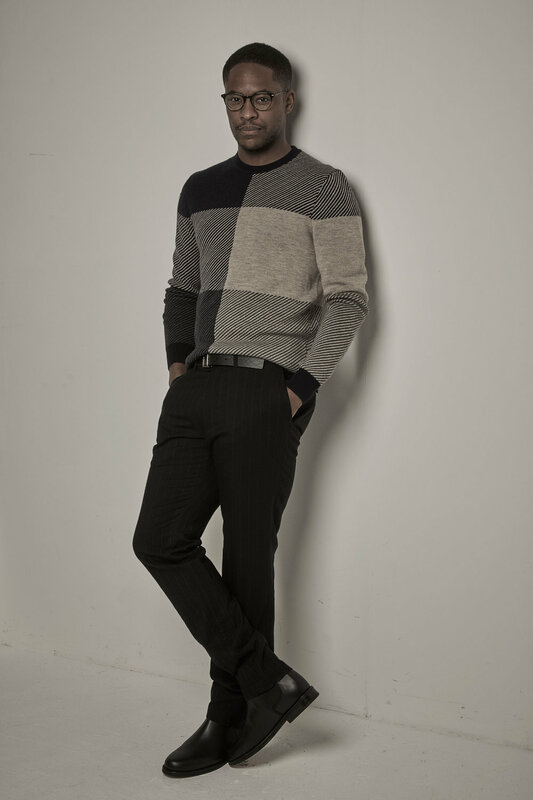 Adetomiwa Edun, photo by Jack Lee. Brillant Nyansago: With a background at the Royal Academy of Dramatic Art (RADA), what did you take away from such prestigious institution and what attracted you to begin a career as an actor in the first place? Adetomiwa Edun: During the first public performance of my final year at RADA, I was standing in the wings waiting to make my entrance, when I realised I had absolutely no idea what my cue was. I started for the dressing rooms to find a script, when I was grabbed by a friend: “Where are you going?” “I need a script, no idea what I’m doing in the next scene!” “Too late!” he shrugged and dragged me onstage. So that was my entrance taken care of. I looked up to see another friend staring at me quizzically. The lights were hot. My panic grew. What now? Silence. I was at a complete loss, and it dawned on me that this was probably my career ending before it had even started. I resolved that at the very least I’d go down with my head held high; so, I straightened my back, took in a deep breath, and with all the bravado I could muster, took a step to my left – Suddenly, we had a scene. It sounds counter-intuitive, but moments like that provided my greatest takeaway, aside from a fantastic classical training, wonderful mentors and great friends: the unwavering conviction that this was what I really wanted to do. Director Annie Castledine set me on the path in the first place. In my final year at university, she cast and directed me as Jocasta in “Oedipus Tyrannos” at the Cambridge Arts Theatre. We’d finished a one-on-one rehearsal one afternoon when she asked me what my post-graduation plans were, and then promptly dismissed them with a derisory snort. She suggested I considered a career as an actor and sat over me whilst I filled out drama school applications. I was accepted and went to RADA. Until that afternoon, I’d never really believed acting was a career option available to me, so I have Annie to thank for showing me that it was. BN: Essentially, William Shakespeare's storyline of 'Romeo and Juliet' is one that can be translated and relatable no matter what culture or race. However, with the lack of ethnic diversity characters' in Shakespeare's work, I'm interested to know whether race played a factor in your approach, playing 'Romeo' at the Globe Theatre Stage. AE: As an innovator within his own time, I’d imagine that, if he were alive and working today, Shakespeare would embrace my casting as a natural reflection of contemporary society. My job was to bring the complexity of the character to the stage in present time and I hope I did that. I worked hard on bringing all the resources I could to my characterisation; to tease out something individual from a role that has a lot of cultural significance attached to it. Race wasn’t a central question in that particular production, but I think that’s as valid an interpretation as if it had been. When it isn´t a question at all, we’ll have turned a corner. 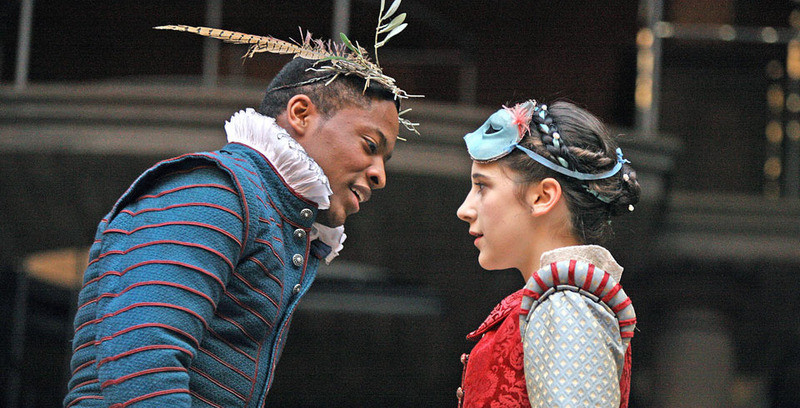 Adetomiwa Edun and Ellie Kendrick as 'Romeo and Juliet' at the Globe, directed by Dominic Dromgoole, 2009. BN: What's your engagement to the live audience in theatres? Are they an asset to your work on stage? AE: Absolutely, the audience in a live show are part of the drama. One matinee at the Globe, declaring my love to Juliet up in the balcony, I stepped back towards the edge of the stage and found my foot moving through thin air— someone had grabbed my ankle and was pulling me backwards. Thankfully, I managed to style it out, smoothly descending to one knee (as I recall it) as I reclaimed my foot and narrowly avoided a tumble into the audience. I’d say the relationship is always that tangible, if not always that physical! BN: You'll soon be starring in an upcoming sci-thriller “In the Cloud;” what can you tell us about the series and the character you play? AE: Your guess is as good as mine! Only joking. But there were some meta moments during filming when it felt like we were losing our minds grappling with the difference between the real world and the virtual world! I play a tech genius who, in an effort to stop a serial bomber, discovers a way to digitise consciousness; essentially, to copy a person’s brain and upload it into the cloud, creating a virtual reality space that others can then enter and explore. Once that’s done, it’s a small step to storing and recreating human beings in virtual reality, while shadowy figures battle to get their hands on the technology. BN: In recent years, there's been a shift focus with emphasis on television and streaming media services – “In the Cloud” being one example of stories that could've been told on the big screen. Do you think television will eventually surpass the cinema? How do you creatively engage with these different genres, in terms of preparing a role for TV, theatre, and cinema (what's different/similar/ideal?)? AE: TV and film tell stories differently—over ten hours (and more) of television you get to spend a lot of time with characters and come to know them, their lives, and their worlds in great depth. With film, you’re zooming in on a brief segment in a character’s life, sharing their journey through a particular moment before leaving them behind. So, I don’t think they’re in direct competition. And there’s a delight to the event of a cinema experience: going to ensconce yourself in a darkened room with a bunch of strangers and lose yourself for a couple of hours in the world conjured on the massive screen in front of you... I still get a thrill! Adetomiwa Edun and Justin Chatwin in Crakle's 'In The Cloud', directed by Robert Scott Wildes, 2018. BN: In FIFA 18 “The Journey 2,” you return as an avatar, playing Alex Hunter; a major footballer in his second season - talk about boyhood fantasy! What's been the reaction from the gamers and did you channel a personal hero for the character? AE: Yes, I can’t say I ever imagined that was one childhood dream that would be realised—to make it as a world-class striker! It’s been amazing how gamers have taken to the “The Journey” and to Alex Hunter. I’ve been approached on the street all over the world by fans of all ages, languages, creeds, colours, gender, all grinning ear to ear, saying more or less the same thing: “Alex Hunter? I’M ALEX HUNTER!" It’s surreal. Having played FIFA through my teen years, finding Alex was more a case of fine-tuning and letting loose an alter-ego, rather than channelling a hero! BN: What are you currently working on and have in the pipeline to be released this year? AE: “In the Cloud” comes out this February; later this year, I will be in “A Discovery of Witches” — I’ve somehow managed to be the only non-magical character in that. I play a nature-wellness guru in an indie black comedy called “Self-Help,” which is currently in post-production.